Adults have 8 incisors, 4 canines, 8 premolars and 12 molars, including 4 wisdom teeth. 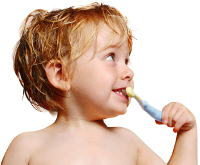 The first teeth that come in during childhood are the incisors. In the lower jaw, they appear between the ages of 6 and 10 months, and in the upper jaw, between the ages of 7 and 12 months. All 20 primary teeth come in by the time a child is 2 or 3 years old, and some of them remain until the child reaches age 12.